The meeting for October 14th (NOTE: earlier in the month than our usual meeting date) is the program rescheduled from March 25th. It is an all day demonstration by nationally known turner and demonstrator Linda Salter [check out her website which has a short bio and photos of her work]. 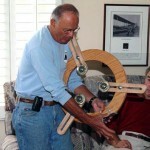 She will be discussing segmented turning from planning phase thru assembly and then turning. 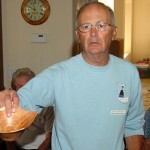 Linda has been very active in the West Bay Woodturners (San Francisco area) and has been president since 1998. There will be a $25 fee for this all day event which includes the cost of lunch. Please email your RSVP so we will know how much food to prepare. 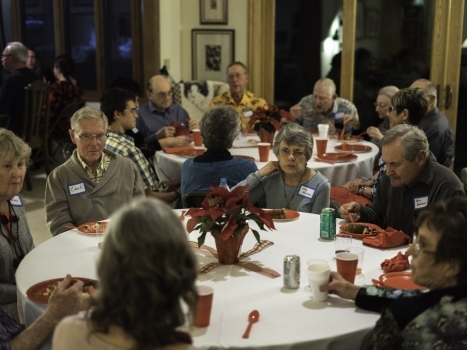 Many of our members have already done this since it was announced in the last newsletter, at the September meeting and by email and they don’t need to repeat their rsvp. 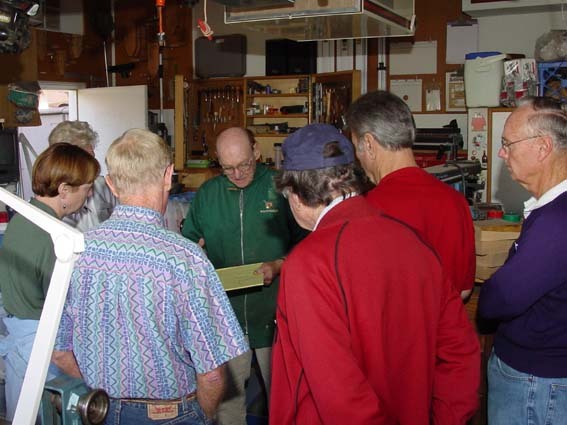 The September meeting at Russ Babbitt’s shop was led by Vice-President Bruce Burger. 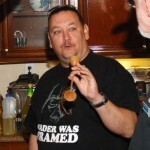 He announced that an executive meeting of the officers and all members who are interested will be held on Oct. 6th at 6:30 p.m. at Joel Oksner’s home. 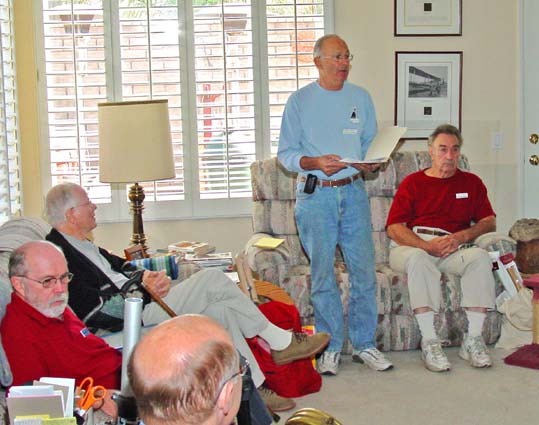 The topics include plans for the rest of the year, report of the nominating committee for new officers, and a discussion of the future direction of the club. Even if you are not currently a club officer but want input into the activities of the club we encourage you to attend. We need your talents to fill out the roster of new officers and to expand the programs that the club is involved in including our mentoring programs. Al Geller is leading the nominating process so contact him if you are willing to help in any capacity. We are particularly looking for people willing to help with the newsletter and website. 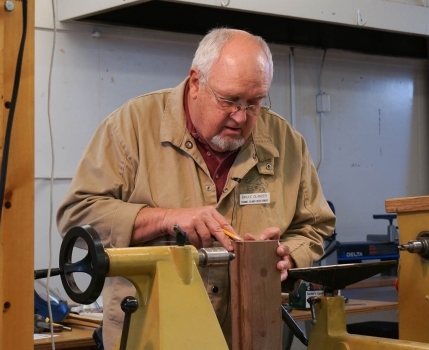 Jim Rinde is again leading our effort at producing a Club Challenge project to enter in the AAW annual symposium next June in Portland. 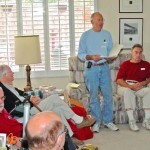 He brought samples of the design concept a working group has come up with and showed how every member of the club can contribute. 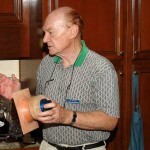 Obviously the details will remain off of our web site until after the symposium. 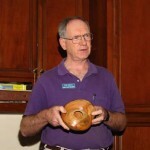 If you missed the meeting give Jim a call for details and to find out when the working group is next meeting. 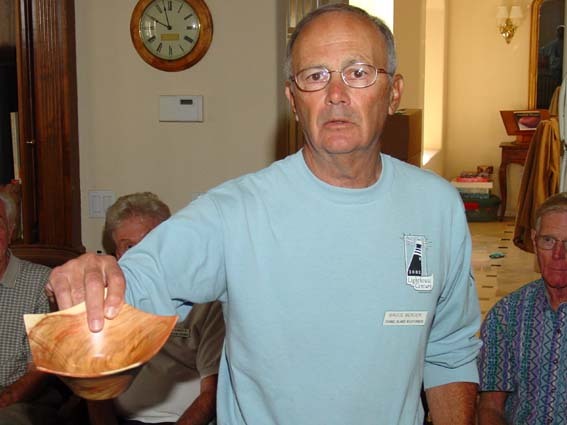 Member Chuck Stevenson is also president of the Channel Islands Wood Carvers. 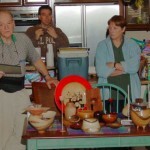 He invited the Woodturners to participate in the Oct. 7th Wood Show that the Carvers are sponsoring. 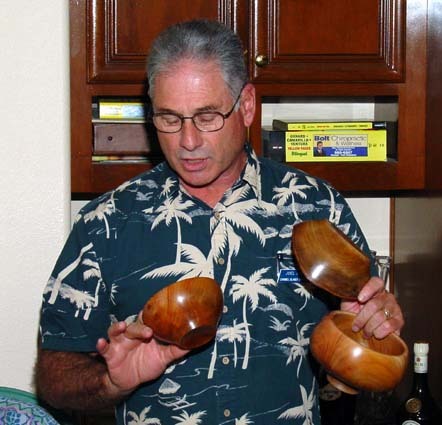 The show is Saturday Oct. 7, from 9:00 to 4:00 at Beidermin Hall behind Sacred Heart Church in Saticoy. The church is on Henderson Rd. Coming east on the 126 Freeway exit at Wells, turn right and right again on Henderson. It is about 1/4 mile to the church entrance. There is no entrance fee but we are asking $1.00 donation at the door. 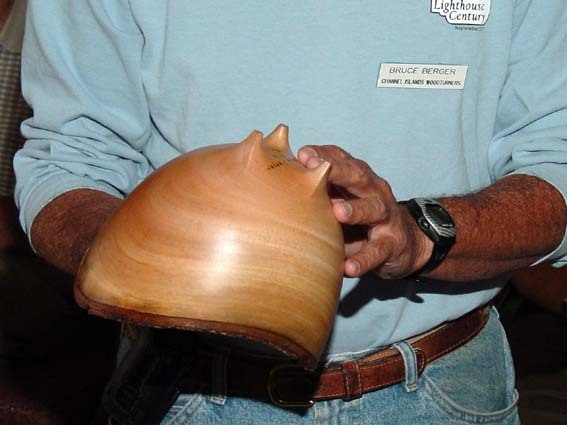 The Wood Carvers, The Woodturners, the Model Ship Builders, the Seacoast Porcelain Painters, and the Ventura Art Club will all be participating. 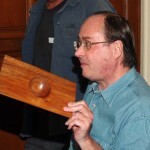 Each group will judge and award prizes for their own group if wished. All entrants will receive a participants ribbon. The Knights of Columbus will have food available all day for those that want it. 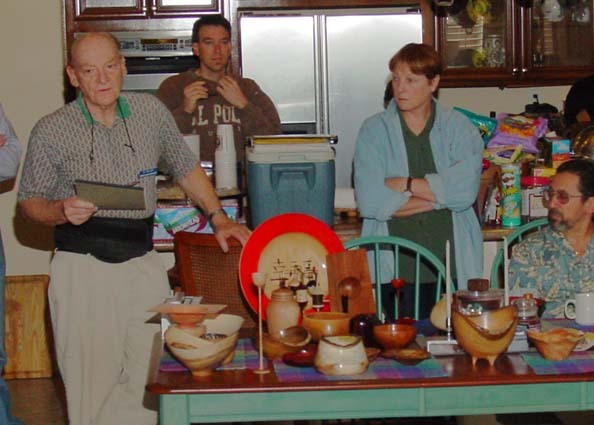 While not designed as a sales event, sales can be made between individuals. This is a very large annual event that gets wide public exposure. 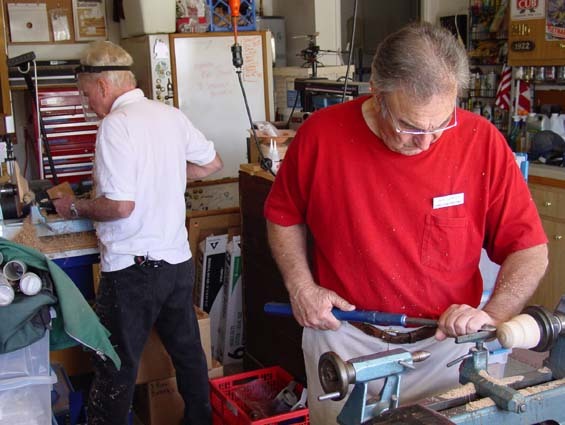 It has been a few years but the Woodturners used to participate on a regular basis and can set up the club lathe and demonstrate if desired. There is a $10 fee to have a display table for your work. Contact Chuck Stevenson at 482-6880 if you have questions and to reserve your table. 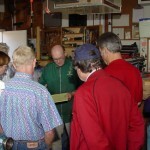 After a lively Show-N-Tell session we were treated to two demonstrations before everyone had the opportunity to use the lathes that were set up for teaching and practicing. 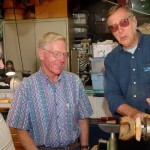 Al Geller demonstrated making square edged, thin winged bowls; and James Dungan demonstrated making thin stemmed goblets. This will be James’ last meeting as he is moving to Oklahoma to be near family. In the year and a half that he has been a member he has progressed from a non-turner to an accomplished turner with great technique and artistic ability. 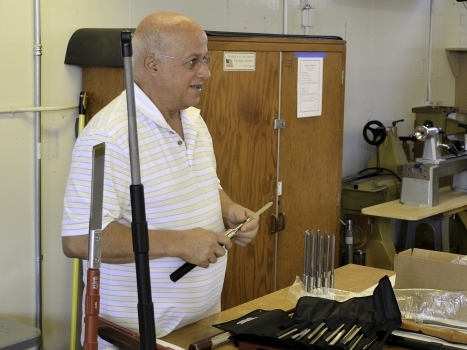 The Oklahoma turning clubs will gain a talented member. 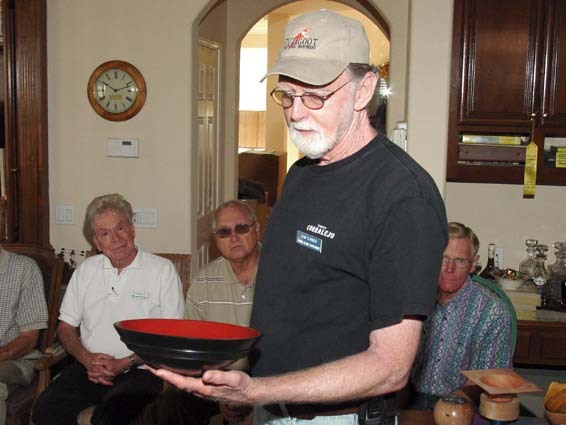 Russ Babbitt holding up his extremely thin rectangular winged bowl that only won an HM at the fair. 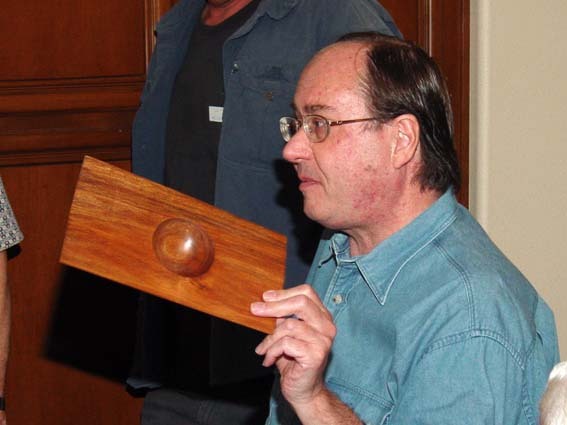 This was probably the most technically difficult and beautiful piece but not considered unique by the judge. 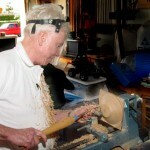 Al showing a partially finished square edged bowl that he would be demonstrating with later in the shop. 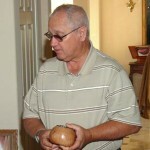 Joel with three avocado bowls he had made for Tim Albers and Mission Produce who provided us with the wood. More members need to contribute to this project to show our appreciation for their support. 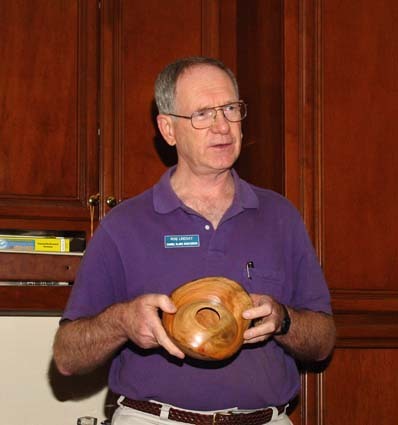 Ron Lindsay holding a natural edged avocado bowl with a hollow form hidden inside. James Dungan with a long stemmed goblet that has chatter work on the bottom. 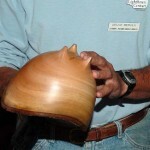 The secret is to do the chatter work before making the goblet. Adding it later doesn’t work! 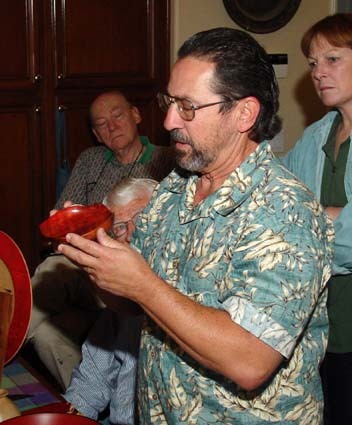 Bruce Berger with a NE avocado bowl that has carved feet. 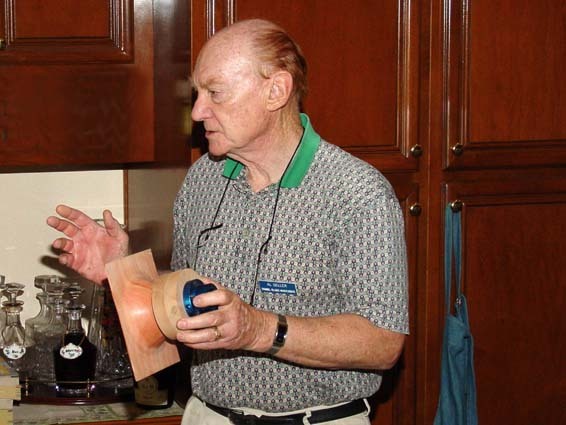 This was taught by John Jordan in a recent demonstration to the club. 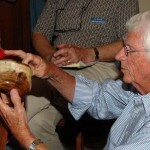 Bruce says that it took him ten times as long to make the feet as to turn the bowl. 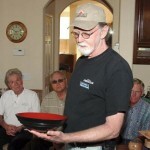 Bruce with a five sided bowl. 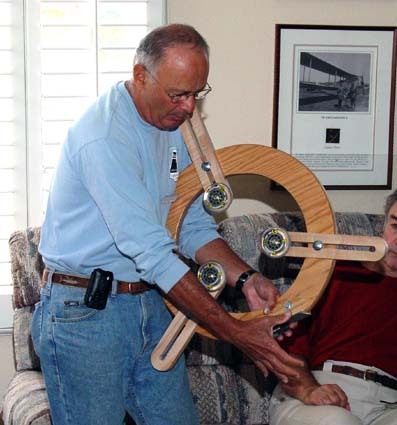 Bruce with his home made steady rest for preventing vibration while hollowing large (and long) vessels. 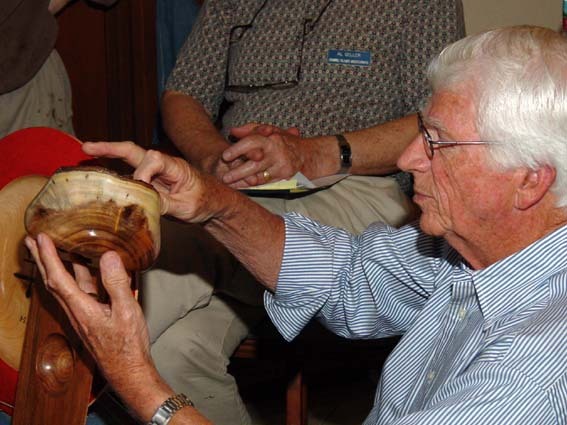 Joe Levy with a man-made “natural edged” bowl (and a new look). A chip out of the edge of the bowl was enhanced by adding scalloped curves to the rim. 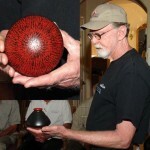 Sam Turner holding a bowl featuring a band of texturing. 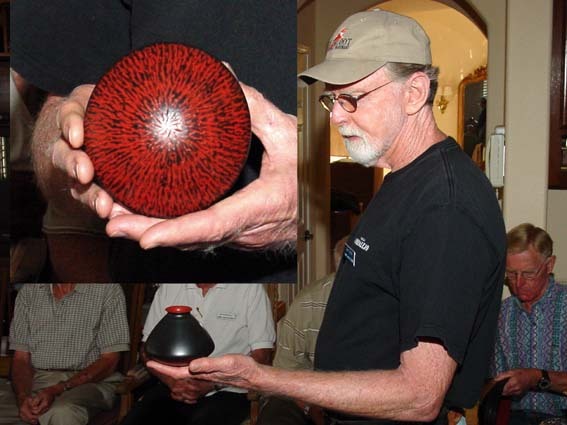 He has been experimenting with milk paint for his finishes. 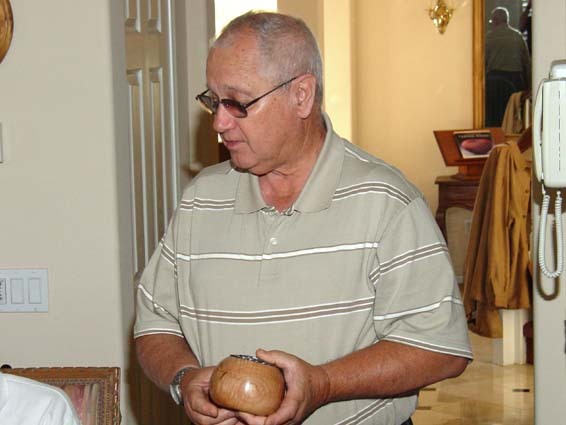 Sam with a hollow vessel with textured bottom enhanced by the two colored milk paint finish. 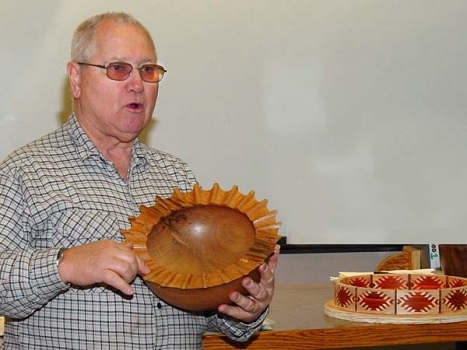 Chuck Stevenson with a potpourri bowl as he described the Wood Carvers’ annual Show on Oct. 7th. Seth MacArthur with a beautiful shiny finish on a natural edged avocado bowl. 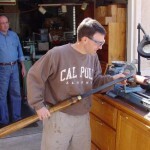 Tim Albers as President of the Conejo Valley Woodworkers Club was given a giant skew chisel as a “gift”. 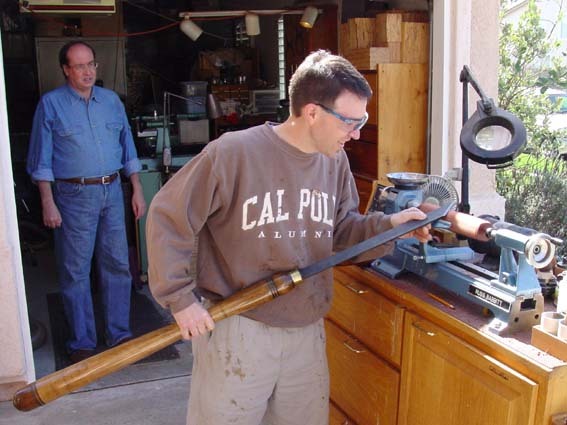 He tries it out on a very small lathe. 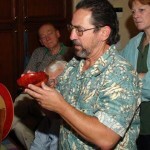 Al Geller drawing out the plans for making square edged bowls with thin wings. A new member putting Al’s instructions to good use. Another recent member practicing his turning technique. 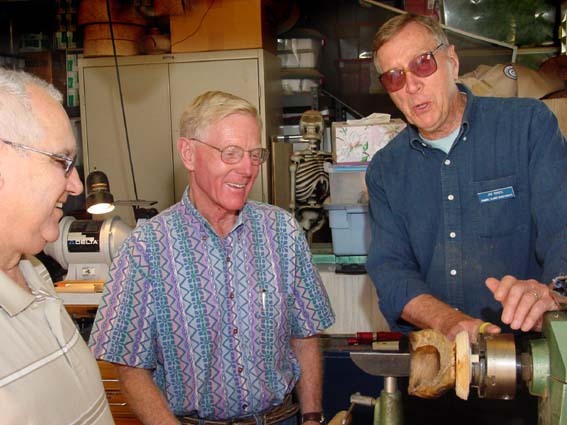 Chuck Stevenson, Jim Hiatt and Jim Rinde looking at an exploded bowl showing why face shields are a good safety practice. Goggles alone would not give much protection!